The Keystone is an architectural item that is produced by the use of the square and compasses in its design. The Provincial Travelling Keystone is an inter-lodge visiting vessel, a rallying point and symbol of fraternal goodwill — take part in the Keystone’s journey and extend your Masonic family. 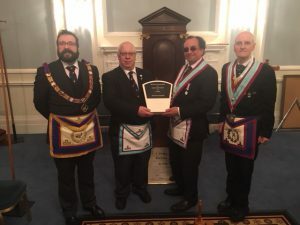 Any Lodge can plan a raid on the Lodge that is in possession to make a claim on the Travelling Keystone and take it back to their Lodge to put proudly on display. Full details on this scheme can be found in the leaflet here.